If you are a skier it is almost guaranteed that you are familiar with this man’s art. Hundreds of thousands of copies of his works are handed out at ski resorts each year. The moment a ski trip is booked in the Scout household, his work is excitedly stuck on our refrigerator to admire and study. His signature is usually hidden in the trees somewhere. 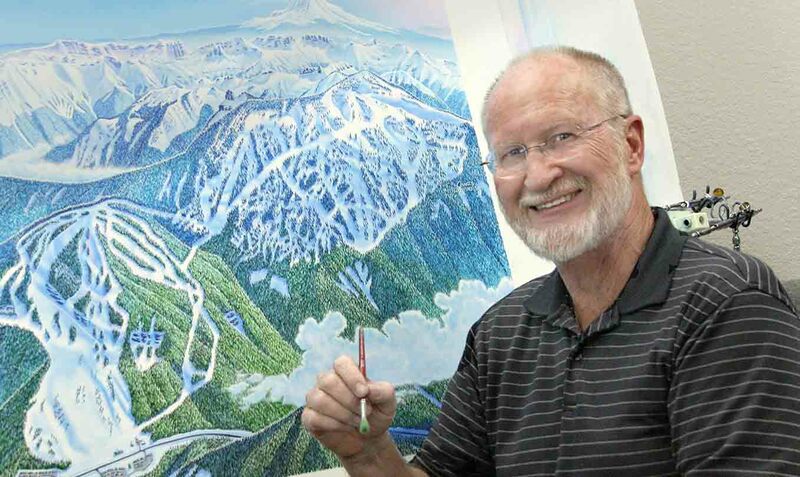 Of course we’re referring to James Niehues, the man who has created ski resort trail maps for 169 ski resorts around the world nearly 30 years. His works are so familiar, that when you stumble upon a trail map that’s not by him, it’s almost disorientating - Scout’s sister once declared, “This trail map isn’t by James Niehues, so I have no idea where I am”. We wanted to find out more about the artist and what goes into creating these fantastically detailed pieces of work. The good news is that he’s delayed a previously planned retirement – all the better for skiers around the world! Scout: How many years have you been painting ski resort maps? Niehues: I have been painting trail maps since 1988. The first being the back side of Mary Jane at Winter Park, Colorado. I had contacted Bill Brown, the trail map illustrator at that time, hoping for some overflow work. To my surprise he was wanting to change his direction into video production, liked my portfolio. He had this assignment for Winter Park and gave me the assignment. This first trail map was also the first time I had seriously worked in watercolor and the rendering took me nearly a month to get the results I wanted, trying to match Bill's technique. 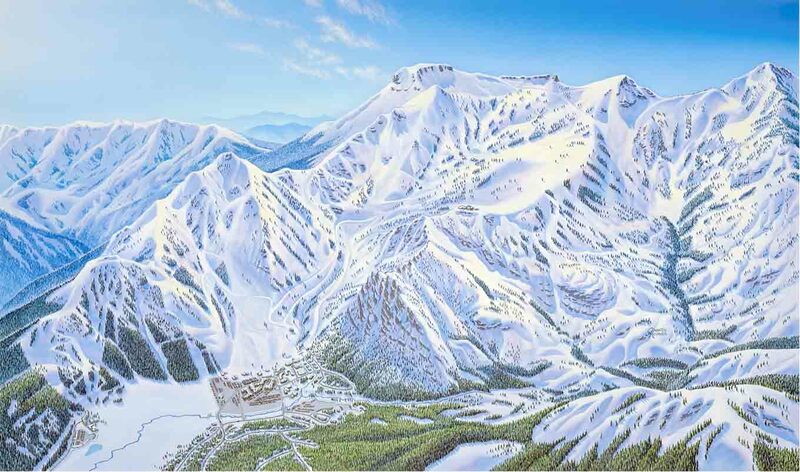 Scout: What was it that made you first get into painting, and more specifically painting ski resort maps? 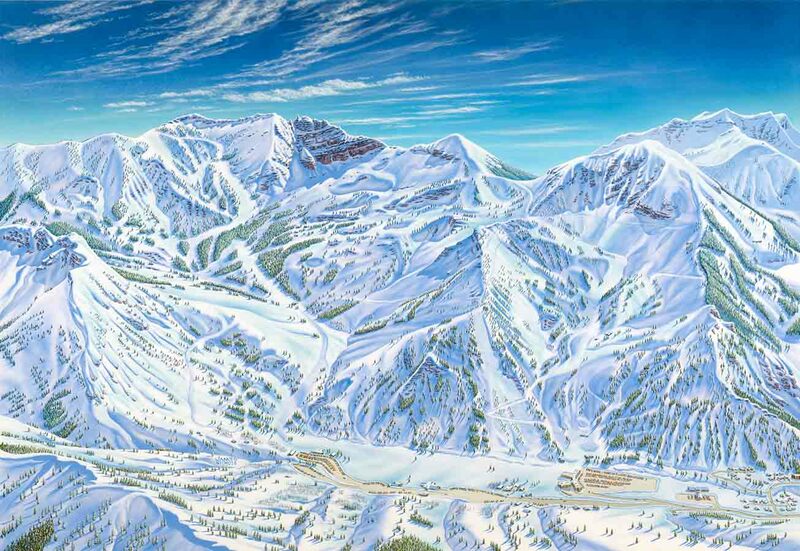 Niehues: I grew up in Colorado and started painting the scenery in oils in high school, but it wasn't until I was 40 years old and after a career that started as an offset pressman, graphic designer for a manufacturer and an ad agency partner that I seriously started painting scenery again ... ski resorts. Scout: Tell us a bit about the process that goes into completing a map? Niehues: My process in 1988 after getting the project was to work from real photographs that I usually personally shot from a Cessna (aircraft) about 2000ft (610m) above the summit. Of course it was film and I was always carrying 10 to 15 rolls of film through the airport in plastic bags for inspection, then upon my return getting it developed and printed. I would then draw a full-sized comprehensive sketch, have it blueprinted and send that out via FedEx to be marked up with revisions or approved by the client. Then I would rub pencil on the back side of the blueprint to transfer the image to the prepared illustration board for the final rendering. After hand painting the image I would again send out a photo of the final color for approval, again by mail. If there were still some changes to make, I would make them and again photograph it and send it out. As you can see, the approval stage could take a very long time. Water color was used because it offers the best way to repaint only the areas affected by future alterations. Once approved, the painting was taken to the photo lab for 8x10 inch transparencies. I saved one transparency for my files and sent the other out for the client to give to their graphic people or printer for the final production. As the digital age came about, film was eliminated, sketches were sent out via email and approvals went from a week to overnight! The digital process has meant better color and allowed me to deliver the final files with complete control of the final files. Scout: Technology would have changed so dramatically since you first started. How have you adopted new technologies? Niehues: Hand painting offers more variety of expression in that each brush stroke is different, making each tree (which usually has the base shape, a shadow and a highlight) individual and natural. 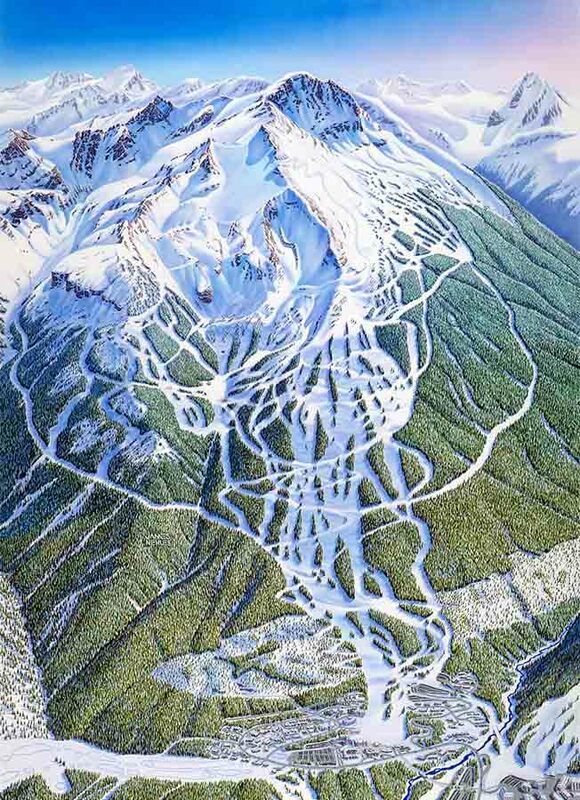 A ski resort trail map represents the great outdoors and the better this presentation portrays the natural vast scenery of the slopes the more inviting it is to the viewer. I used to have a slogan that I used in my mailing to potential clients: "A quality trail map reflects a quality ski experience." A trail map must first be accurate, but a very large part of the equation is for it to be as beautiful as possible to entice the viewer. I just haven't seen any computer-generated images that do that better than a hand-painted image. Scout: I'm sure all maps are different, but how long do they usually take from when a resort first contacts you until when it's finished? Niehues: The Big Sky trail map coming out in the 2014/15 season was worked on over a period of six months from their initial commitment. I presented their marketing manager with several thumbnail sketches that I felt would best represent their mountain. The concept of three views was approved and we set up a visit for the photo flight. I skied the mountain, flew it with them and reviewed the project in person to make sure we were going to address their concerns. The three comprehensive sketches were produced in a week. The main view was painted in about two weeks, the Southern Exposure was painted in about a week and the bowl, not having many trees, was three days. Scout: What's the most challenging part of creating a map? 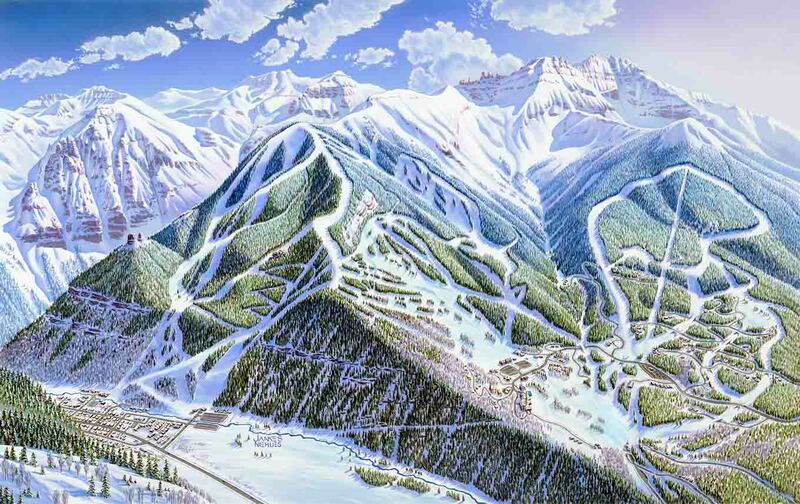 Niehues: Most resorts have more than a single face to them with slopes hidden from any single perspective. The most challenging part of any multiple faceted resort is moving all the elements so the entire system of runs can be shown in one view, without the viewer seeing any reason why it not just as it is portrayed! In the case of Big Sky, the "satellite perspective" was the only way to get all trails in and the decision was made to stay with the more conventional view and have several perspectives to show the vastness of the area. Scout: Resorts are often adding lifts and runs or changing terrain. How easy is it to change an existing map or do you have to start again? Niehues: With today's Photoshop it is relatively easy to make changes to the original image. If it is only a trail or a building I can usually use Photoshop only. Depending on the complexity of the features changed or added I may choose to repaint the area affected, photograph it in my studio and splice it in. If the changes take in a larger portion of the view I will repaint the section affected and get a new digital capture of the entire painting. Scout: Other trail maps just don't seem to be as easy to follow as a James Niehues map. What is it that makes your maps so much better than others? Niehues: Detail, detail, detail. A map must be credible and the more detail the more credibility. 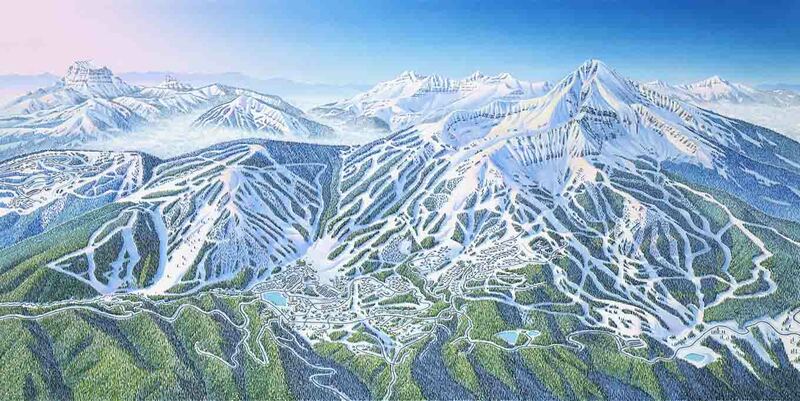 Scout: How many ski resorts in the world feature James Niehues maps? Niehues: My figures show 227 different trail map perspectives for 169 different ski resorts - worldwide. Scout: You probably know the world's major ski resorts better than anyone. What are the elements you think make up a great resort? Niehues: I'm an artist - the more dynamic the setting the better, cliffs, peaks, bowls, etc ... but, that's just a visual thing. Being an intermediate skier I kinda like the groomed slopes. Scout: If there were only five ski resorts in the world, which five do you think they should be? Niehues: Wow, five! I will give you five from the ones that I have painted and are on this list because they made a beautiful painting as well as had dynamic terrain! Blackcomb, Squaw, Telluride, Big Sky, and Alta. Scout: Great choices James! Finally, you are heading into retirement. What are your plans? Niehues: Several months ago I was set to fully retire after completing the projects I had in the works. However, in re-evaluating I am finding that I truly would miss painting a resort or two a year! At this time I will continue to update the resorts that currently use my illustration and take on only a couple of new projects. I love the Oregon Coast and last year during a visit I flew and photographed the coast from the Columbia River south to Tillamook. It is sketched and ready to paint as soon as I get an opportunity. Then, my computer has thousands of scenes that I would love to paint, and I want to paint on location ... just not enough time! Support James via Kickstarter as he prepares to launch his first coffee table book, showcasing his best work to date. Trail Map Answers 1: Squaw Valley. 2: Big Sky. 3: Blackcomb. 4: Alta. 5: Telluride.